The Kennebec River’s free flowing section between Waterville and Sidney is a productive and beautiful reach of the Kennebec. I also float several productive sections of the Androscoggin and Penobscot Rivers. You will be fishing from a customized Freestone Drift Boat. 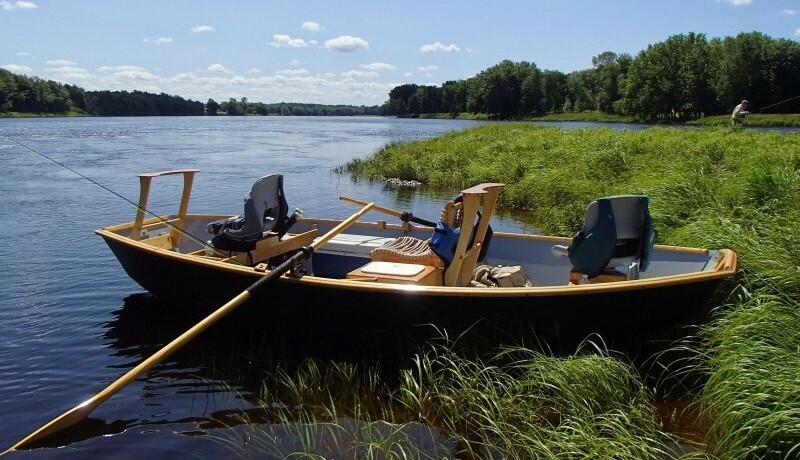 Two fly fishers or spin fishers can cast while seated or standing from this comfortable drift boat while casting to one of Maine’s most prolific game fish: the feisty smallmouth bass. Contact me to schedule your guided drift trip. 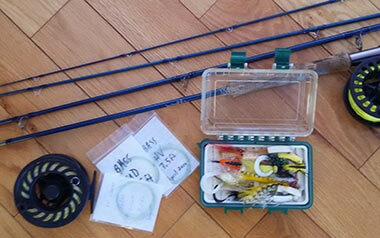 Clients will occasionally ask me, “Do you have a favorite river?” That’s often a tough question for a fishing guide. The Kennebec is my home river and over the years I have come to know it intimately. My wife and I live on the free flowing section of the Kennebec River in Vassalboro. It’s a stunningly beautiful section with a very healthy population of smallmouth bass. 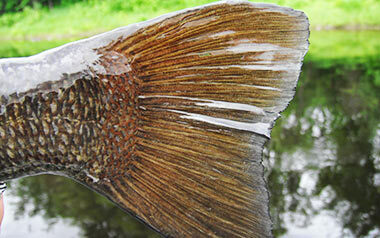 No other Maine river has more of its native anadromous fish. In addition to the millions of returning river herring including: alewives, bluebacks and shad, during a June trip we may see several atlantic and shortnosed sturgeon launch from the river’s depths. With the added possibility of a striped bass mistakenly inhaling your smallmouth fly, one would assume that the Kennebec would be the favorite. For these reasons and more it could be my favorite. Not too long ago I lived in the Androscoggin River watershed. At that time, I considered a section below Rumford my favorite. I cannot dismiss the Androscoggin River’s beauty, but then and now its claim to fame remains the smallmouth bass “smallies” themselves. 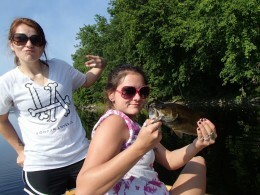 If you want a good chance to hook a trophy bass, the Androscoggin is your river. There is little doubt the fish play a major role in determining one’s favorite, but great fishing is only one of many important aspects for me. With that said, the Penobscot River is my favorite for a host of reasons. 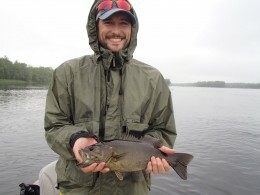 First, my passion for smallies began while fishing the Penobscot’s Mohawk rapids. It’s where I spent countless summer hours wading through the rock garden casting deer hair bass bugs to aggressive smallmouths. READ MORE. I grew up in a coastal Maine community and was fortunate to spend my formative years on Green Lake in Ellsworth. After graduating from the University of Maine in Farmington I headed for graduate school in Canada. Within months of graduating from the University of Manitoba, I was back in Maine where I have remained since.I now live with my wife Denise along the Kennebec River in Vassalboro. It’s a beautiful stretch of the river with lots of wadable shoreline.Long before building our home on the Kennebec, I was hooked on Maine’s smallmouth bass. 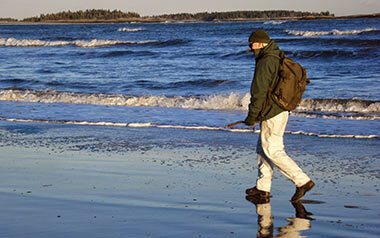 During the past thirty years I have fished hundreds of Maine’s lakes and rivers. In those early years... READ MORE. 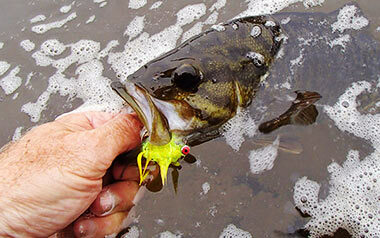 Three Rivers Guide Service specializes in drift trips on Maine’s premiere smallmouth bass rivers. The Kennebec River’s free flowing section between Waterville and Sidney is my home water. It’s a productive and beautiful reach of the Kennebec.In addition to several other sections of the Kennebec, I do drift trips on several productive reaches of the Androscoggin and Penobscot Rivers. READ MORE.